This year my Christmas is going to be spent in a much smaller home and I must say so much easier to decorate. That being said my Christmas tree is also small. I decided to make some cute Christmas tree ornaments made from ribbon and twigs. I did a Youtube video so you can see how it’s done. 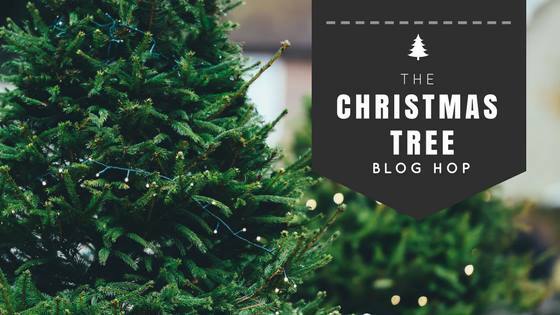 So grab a cup of your favorite beverage, settle in and get comfortable because you are going to love the beautiful Christmas Trees Decor shared today! Special Thanks to Michelle from Our Craft Mom for organizing this! We are going to downside soon too and I hope I can still take my tree with me. This such a sweet tre. The crate is adorable as a holder for it! Love the simplicity! Such a lovely tree! And the Canada Dry box is so perfect with it! LOVE! Yeah that crate cracks me up, its fun how we reuse stuff and create something different. Marci, glad you are like me and cherish moments our loved ones touch! This has made me think about decorating my next home with more of my memories! The last one I had put many things in storage, but I think that was more for staging, but since this is my last home, Anything goes. Your tree is charming Maria. 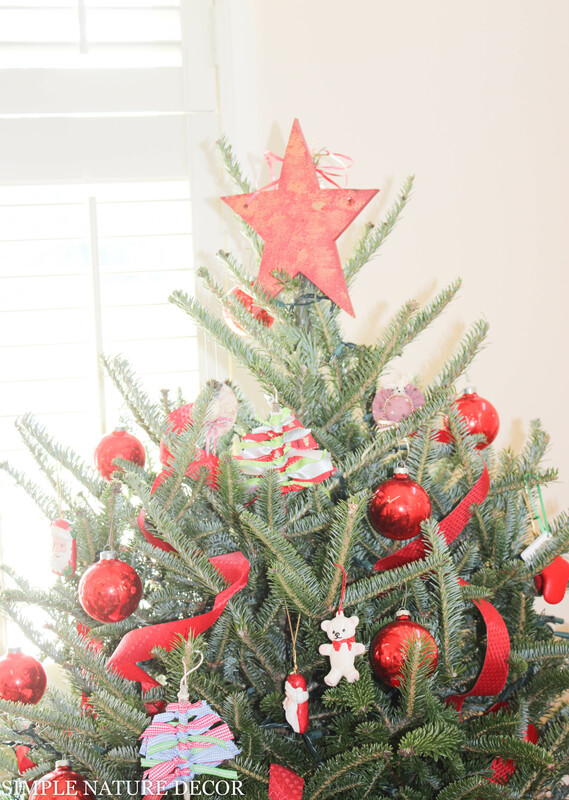 I am all about the ornaments that were made by my children or family members or friends…it’s those traditions that are so important at Christmas. Enjoy your holiday in your little cottage! I was so excited to see your Christmas tree decorating. I KNEW it would be lovely and inspiring. I love the ribbon weaving in and out of the branches. Thanks for sharing. 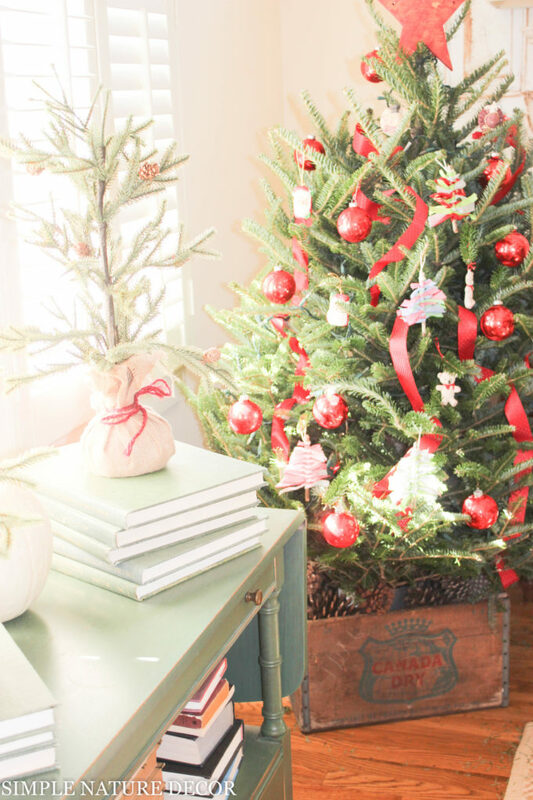 I love the little fabric Christmas tree ornaments on your tree….and that crate is so cute! Thanks Ricki, I was thrilled that I could use some of my vintage fines in my storage. Beautiful!!! I love family decorations and only have one little photo of my children when they were young on our tree this year… a little silver pin I inserted a photo of them taken at Sears with their Christmas My Twinn dolls from long ago now. <3 Hopefully next year I'll have a family tree again when our goods come out of storage. Happy Christmas to you and your family!!! Sharing on G+ and pinned for you. Barbara, thanks for stopping by! Have a lovely Christmas. I love the box you put your tree in and all the decorations. So pretty! Adorable! I have often thought of using ribbon to decorate our tree, but have yet to do it. It looks perfect on your little tree. I too love the box you have it in, especially since Canada Dry is my favourite gingerale!! Such a cute tree, I love all the red. And that box, love it! I’m so bummed I couldn’t make the hop with you guys. Next year for sure. Next time I hope you are in the home tour. Merry Christmas. Maria this is so pretty. Love that little crate you have added on the bottom. The colors bring back memories of years gone by, very rustic vintage in a nostalgic kind of way. Yeah, this year I have been using up all my vintage stuff! Normally I had many of it stored away. Most of my decor in the last home was contemp with some rustic stuff. Lets see next time, I always changing to spice things up. What a darling tree and tree stand! Your creativity and talents are really shining brightly! Perfect time of the year to reflect and rejoice in the memoires we hold dear. Thanks my dear! its been great getting to know you and all the nice people in this blogging journey. 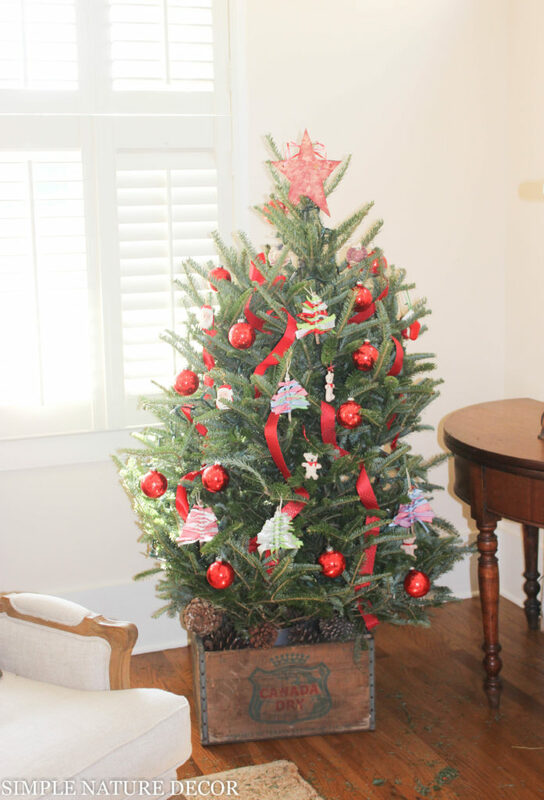 Your tree is so rustic and charmingly simple! I love the wood crate! Genius! Jeannee, Thanks… Its such a fun project hope you get to make one. It’s so pretty and festive!! I love that crate! Thanks Meg for stopping by, hope you have a Merry Christmas. Beautiful tree! I love how you put it in a vintage crate- so simple and pretty! Maria, your Christmas Tree is so beautiful!! I’m obsessed with the crate you put it in. What a great idea and the pops of red are perfect!! Thank you so much for joining us on this blog hop! So pretty. Love the traditional red and green. Your crate just make it even better. Love this blog hop! I like your simple and creative little tree. Good luck with the new house. Visiting from the blog hop. 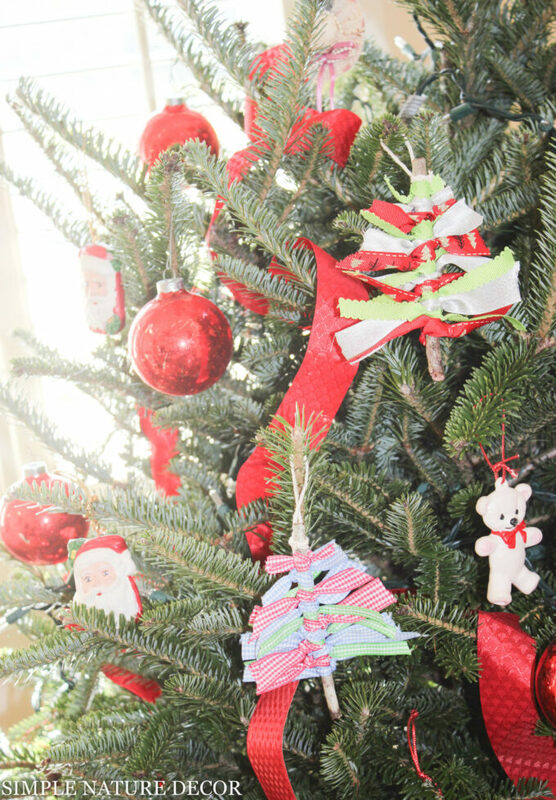 Homemade ornaments are the best and the star made by your son is the perfect topper. Lovely tree. Thanks so much for the lovely comment. I cherish that Red star. Thank you Nicole. It was a cute tree, just took it down last friday. Happy New Year.